All 13,00 residents of town had to flee. HIGH RIVER, Alta. — It's been a busy three years for one of the southern Alberta communities hardest hit by extensive flooding three years ago. The mayor of High River south of Calgary says the town has come back stronger than ever, even though it hasn't been easy. Craig Snodgrass says the first priority was to protect the town by building new berms and dykes on the Highwood River to handle a flood 50 per cent larger than in 2013. The river flooded much of the community and turned downtown streets to raging rivers; it took weeks to pump water from one neighbourhood called the Hamptons. All 13,000 residents of the town had to leave and scores had to be rescued from rooftops as water rose over the tops of cars. Snodgrass says the downtown area has seen some big changes that have made the town more walkable and more appealing to businesses. The province says the floods were the worst in Alberta's history. More than 125,000 people were forced to flee and more than 30 communities were affected. Some residents are still dealing with flood-related issues. "There's a lot of construction that we're finishing up this year, a new provincial building being built with 100 and something employees in downtown High River," Snodgrass explained. "That just feeds all the retail and the restaurants and the service industries." Cities and towns stretching from the Rocky Mountains in the province's west all the way east to Medicine Hat were damaged. 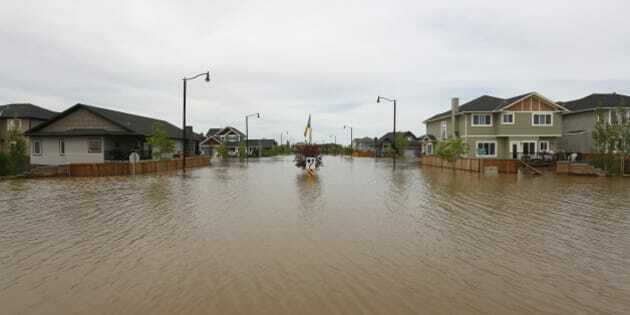 High River had 350 millimetres of water over a two-day period. Insurable losses were pegged at more than $5 billion. The town was to hold a service Monday night to acknowledge the change the flood has brought to the community.